If you’re a developer, looking to create Visio-based solutions, then you’re going to need to programmatically connect Visio shapes together. Wouldn’t be nice to have a snippet or two to start from? Today’s post shows you VB and C# code that instructs Visio to connect every shape to every other shape, and to create a beautiful mess, like that shown in the image at left. Now, I strongly recommend the Visio 2007 SDK. It is an excellent, free download, and it has lots of snippets, utilities, sample code and sample applications, including examples of how to connect Visio shapes with code. This seemed like an interesting example to me, and one that might appeal to folks who are creating network-related Visio-based solutions. And even if it’s not exactly the code you need, it’ll surely be a good place to start from. The Undo Scope code is found in the main procedure. When the code is finished running, you’ll see a named operation Undo Connect All Shapes to Each Other in the Edit menu. This makes things a lot easier, and more clear for your users. 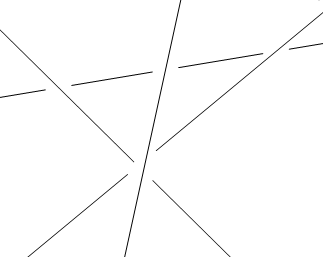 The shape filtering in m_getShapesToConnect demonstrates the use of the Shape.Type property. With this information, we can decide which shapes don’t need connecting. In our sample code, ignored shapes include: Foreign Objects, 1D shapes, or Guides. Ignoring Foreign Objects, allows us to place a VB Button on the page that calls the VBA code when clicked, but the button won’t end up with connections being glued to it. 1D shapes are most likely connectors, and you won’t want to connect connectors to other connectors! m_connectShapes illustrates how to determine which version of Visio you are running, and then two different ways to connect shapes together. Just before finishing this article, I realized that if you’re running a version earlier than Visio 2007, you might have to comment out a portion of the code, because it won’t properly compile — the Visio 12 method: AutoConnect doesn’t exist in Visio 2003. See the procedure for more notes. Below is the VBA code to get the job done. If you want to use VBA, you can copy the code and directly paste it into the ThisDocument module of any document’s VBA project,. Add the line: Imports Visio = Microsoft.Office.Interop.Visio. 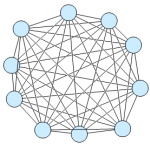 To connect the shapes, simply run the ConnectAllShapes subroutine. Edit: 2014.02.14 I’ve added “Set” before object assignments in the code below, plus some clean-up code. The absence of “Set” statements was causing confusion. You don’t ned “Set” in VB.NET, but you do in VB6 or VBA. '// decides whether to use the old way or the new way. '// in the Page Layout section. '// page, and choosing Window > Show ShapeSheet. I created a partial class for a Windows Form, so that it was easy to call the code via a button click. You might have to mess with the namespace and class name to get it to work, but it should just be a few lines. You’ll also have add a reference to the Visio 12.0 Type Library (or Visio 11.0, or…) in order to get the “using Visio…” line to work. To get the ball rolling, make sure you have an instance of Visio running. There should be a document open that has some shapes that you don’t really care about. 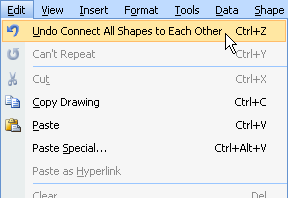 Then, just call the m_connectAllShapes proc and the connections will appear! // decides whether to use the old way or the new way. // in the Page Layout section. // page, and choosing Window > Show ShapeSheet. Edit Visio Masters Programmatically…the Right Way! Previous Post: « How Many Fill Colors Can You Put on a Visio Shape? …and like I mentioned above, it might be a good piece of code to start with. A Visio developer could modify the shape-filtering in m_shapesToConnect to do something a bit more useful – like connect all Routers together or something. I have never used VBeditor before and I am trying to use your script. I was able to insert the script in the Visual Basic Editor through Visio 2007 but then I am not sure what to do after that. I chose the macro after this step but it didnt do anything. Can you explain to this dummy how to get it going? i looked over the resources but still havent figured it out. I am not looking to learn vba, I just want to run this one script. Do I need to change variables in your script? Like since I’ve named my pages should I change the “pg” in “Call m_ConnectAllShapes(pg)” to the name of one of my pages? are there any other variables that need to be changed? Thanks Chris, this did the trick. Used some parts of you code to connect shapes. Some small changes, and now it connects using the connection points instead of the shape itself. I am glad you figured out something useful to do with this, and that you realized it was just supposed to be sample code for instructional purposes. If people are wondering how to glue to specific connection points, then here’s some more info. I am new in VISIO and in VBA in VISIO. That sounds like a solution for my problem but I need to ask you a question. Does that also work if I have an Excel Sheet behind and just want to connect the shapes with the value true from the excel sheet? First congrats on all your stuff. When I copy and paste the code (using visio 14) it does nothing. I’ll go and correct the code in the article. The VB code should work also in Visio 2010? I’m asking because when it runs I get an error Compile error: Argument not optional and the collShapes = under ‘// Add all the non-connector shape… gets highlighted. I would appreciate any hint on this. Below is the VBA code to get the job done. You can copy the code and directly paste it into the ThisDocument module of any document’s VBA project. I want to say a big THANK YOU! for this piece of code. The VBA code require some “set” to be added, but finally it works. I needed to connect 72 shapes in an any-to-any manner to reflect the functionality of a network tunnels. So, you can imagine what this would mean to do it manually. Calin, thanks for sharing the image link, very cool! Ok folks, thanks for chiming in. I’ve added the “Set” statements to the VBA code, so it will actually work in VBA. Let me know if I missed any! So great! Ok with 2013 version.